I can restore your vintage vacuum tube radio. If you have a family heirloom or you just want your vintage radio restored, I can help you get it working again. A restoration is different than just a radio repair. A repair will only replace components that have failed in order to get the radio to play. A restoration will replace capacitors that are prone to failure and update the electronics so the radio will be reliable and play for many years. If the capacitors have not failed yet, they will most likely fail in the future. Restoration consists of replacement of all failed components, and those prone to failure. Replace all electrolytic capacitors. Humming in a vintage radio is usually caused by the failure of the power supply filter electrolytic capacitors. Replace all wax/paper capacitors. These are prone to failure and should all be replaced with modern equivalents to improve reliability. Replace out of spec resistors. Over time the values of the resistors change enough to affect the overall performance of the radio. Rebuild Bakelite capacitor(s). One capacitor in many radios is connected across the 115-volt line and provides RF filtering. These capacitors are potentially unsafe and should be replaced. Install in line-fuse. This provides protection to the radio if something should short out or draw too much current. Install new power cord. The power cords are almost always damaged and generally are unsafe. Install Inrush Current Limiter. This prevents stressing the vacuum tubes when the power is first turned on extending the life and reliability of the electronics in the radio. Replace any frayed or damaged wiring. I have found that most radios of this age have damaged speaker wiring and sometimes the grid cap wires on the top of the chassis. These are replaced with a cloth covered wire to maintain the original look. Rebuild pilot light holder. They are generally melted and not working. Align the chassis so it plays at peak performance. Extended operational check to insure the reliability of the radio. Speaker repairs and re-coning of speaker. Replacement of any bad vacuum tubes. Replacement of speaker grill cloth. Replacement of knobs. These can be very hard to get! Undo poorly done or botched repairs. Over the years many of these older radios were subjected to poorly done or botched repairs. It can sometimes take quite a bit to remove these badly done repairs. I try to restore the cabinet rather than strip and refinish it. This will increase the value of the vintage radio. Sometimes the original finish is too badly damaged for a restoration. In that case I can re-finish the cabinet. Glue any loose veneer and cabinet joints. Replacement of missing veneer. It is very difficult to match a 70-year-old veneer and have the color and grain match, but I do the best I can. Stain to restore and even color. Replace any missing or damaged hardware if available. Restorations are warranted for one year. If your radio stops working, return it to us and it will be repaired at no charge. You pay for shipping to us; I pay for the shipping back to you once the radio is repaired. Chassis restoration generally runs about $25 per vacuum tube in the radio to restore the chassis. If you have a 5-tube radio, the restoration cost would be $125 plus shipping. This is a standard restoration and does not include any extras such as vacuum tubes, knobs, speaker grill cloth, speaker repairs, cabinet refinishing, undoing botched repairs, etc. Once I evaluate the condition of the radio I can provide an estimate of the total cost to restore. Cabinet restoration is on an individual basis and starts at $150 for a table radio on up depending on the damage and the size of the radio. If I cannot restore your radio, you will be charged a $45 diagnosis fee plus return shipping. Radio must be pretty much unmolested. If anyone has modified the radio I may not be able to restore it to its original condition. It must have all original knobs. Knobs are very hard to get and I don’t have the time to track them down. Sometimes I have knobs available, but not often. Power Transformer working and not burned out. It is extremely difficult to replace a transformer with an original. They can’t be found. Speaker not badly damaged. Re-coning of a badly damaged speaker can be quite expensive. 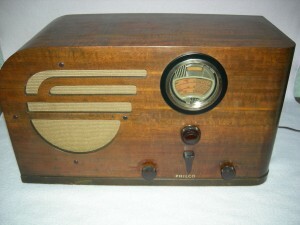 I do not restore Philco models made in the 1940s that have rubber wiring. The radio has to be completely re-wired to make it operate reliably and safely. That is generally not economically feasible for these radios. DON’T SHIP ME A RADIO WITHOUT CONTACTING ME FIRST! Contact Me and give me the model radio you have and any information you might have on the condition of the radio. Try to send a picture of the front panel and the back of the radio so I can see the chassis. Don’t plug in the radio to see if it works! If the filter electrolytic capacitors are shorted you will ruin the transformer or other components. You might also see smoke. Because these radios were not fused, the chassis can be damaged very easily. This can cause un-repairable damage to the radio – most likely the power transformer.